PORTLAND, Ore. (August 16, 2018) – The Portland Trail Blazers and Moda are proud to announce the Sixth Annual Rip City Rally, formally known as the Rip City Relay. Beginning Monday, September 10, a team of Trail Blazers and Moda ambassadors and staff will embark on a week-long journey to cities and towns across Oregon, engaging with Trail Blazers fans all along the way. This event brings Oregon communities together with energy and enthusiasm to showcase the Trail Blazers as “Oregon’s Team”. Klamath Falls will be the starting point of this year’s rally on Monday, September 10. From there the rally team will be traveling north to Bend on Tuesday, September 11, Prineville on Wednesday, September 12, Madras on Thursday, September 13, and finishing in Hood River on Friday, September 14. An entire day of events are being scheduled in each city along the route. As part of the Trail Blazers’ and Moda’s partnership to showcase healthy and active living, events will focus on providing activities for kids, including school assemblies, Youth Basketball PE Takeovers and on-court Youth Basketball Activations at the Rip City Rally. The visit in each city along the route will conclude with a ceremonial flag raising with city officials, followed by the Rip City Rally, a free community fair from 4-6 p.m. featuring activities for all ages. Supporting partners of this year's rally include COUNTRY Financial, Energy Trust of Oregon, Pacific Power and Windermere Real Estate. COUNTRY Financial has teamed up with the Trail Blazers in helping fans achieve their goals, and reaching the community where they Live, Learn, and Play. Because even the biggest goals start with simple steps. Energy Trust, in collaboration with the Trail Blazers, has been instrumental in Rose Quarter sustainability efforts, and will be giving away free limited-edition Trail Blazers shirts as part of a free home energy review at all stops along the rally. Pacific Power is teaming with the Trail Blazers to achieve their vision of being the greenest NBA team in the league by championing new and hands-on ways to make households, businesses, and communities across Oregon more sustainable. Windermere Real Estate is proud to be part of the Rip City Rally, where agents will hold a drawing for an autographed Trail Blazers basketball, hand out Trail Blazers keychains, and host a coloring station for kids at the Windermere tent. 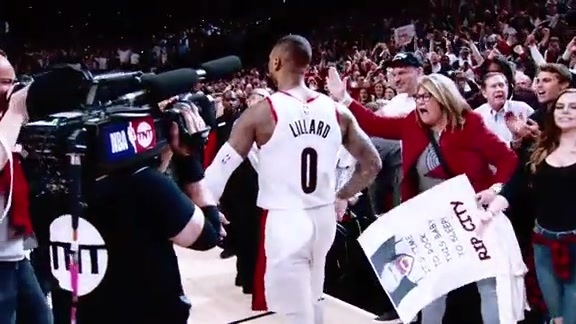 Many Trail Blazers personalities will participate in different legs of the rally, including Trail Blazers TV Broadcasters Kevin Calabro and Lamar Hurd, Courtside Reporter Brooke Olzendam, Trail Blazers Alumni Brian Grant and Bob Gross, In-Arena Host Todd Bosma,Blaze the Trail Cat, the BlazerDancers and more! Please visit trailblazers.com/rally to get updates and information all along the rally.